← Mail Sack 1/14/13, Various topics…. The season has started, and we are 90 days away from the first College of the year. If you have a core motor in your shop, or are about to get one, it is time to get going. In this ongoing series, I am giving something of an over view of the build process, but my real intention is to get builders in action. 2013 has started. Would you like to have a running engine this year? Like to see some undeniable physical progress? Is the midnight shift of magic elves laying down on the job at your place? Get out the wrenches, fire the elves, and let’s get going. Every engine starts with a Crank. Three ways to go here: 1)Processed 8409 GM crank, 2)New Weseman Billet crank, or 3)”Internet Red Chinese.” For people who actually believe in the craftsmanship of workers at the $3 a day level and the business ethics of communist leadership, I suggest clicking on this link for my story on “Chinese Crankshafts“. If you still think these things are airworthy, and your going to put one in a pusher aircraft with a 70 mph stall speed, let me remind you of the adage “the pilot is the first person at the scene of the accident” really applies to pushers, and the engine often arrives .006 seconds later and hopefully doesn’t make it all the way to the instrument panel. One of the perspectives I have on the new crank is this: A guy who was looking at buying a Jab. 3300 or Rotax 912 has to budget about $20K for one. Same guy, willing to do some assembly and learning, finds out that he can build an absolutely first class, spare no expense, 3,000 cc Corvair for 50% of this. Yes he has to do some work, but some people got into homebuilding to learn, build and fly and they welcome that part of a Corvair. Same guy starts looking at a new billet crank as an upgrade; if it raises the price of the engine $1,100 or so, the engine only becomes 57% of the price of an import. Something to think about. Above is a close up of a 2nd Gen Dan bearing journal on a re worked GM crank. This is a 2700/2850 ready case we put together and sold to Irv Russel at CC#24. Ok, lets talk about option 1), prepping the GM 8409 crank. This is the most popular option by far for building a Corvair, and it will remain so for a long time. A) build a 4 bearing engine, and keep the option open of installing a Dan bearing later. B) build a Dan 5th bearing engine. C) build a Roy 5th bearing engine. Option A) has been popular in the past, but it is important that builders understand that I am letting everyone make up their own mind, but I am whole heartedly recommending that people budget a 5th bearing into the building of their airplane. I personally feel that having a super nice paint job or radios or a glass cockpit on a Corvair powered plane that doesn’t have a 5th bearing is a judgement error in prioritizing. Think about this: I don’t build or sell engines for people unless they have a 5th bearing on them. Option B) If you build an engine and you know that you are going to put a Dan bearing on it, you have two options; you can use a gen 1 retrofit bearing, but on a new build engine it makes more sense to use a gen 2 bearing, where the added steel bearing journal is fixed to the crank and ground concentric when the crank is processed. This is the system pictured above, and this in the one I currently use on all of our production engines. Option C) Roy has been making 5th bearings for a number of years, and I have used them on production engines. They are CNCed, but they are hand fitted and line bored to each builders case. This means that the builder must send his case to Roy, and that Builders must be prepared to wait a bit because each installation requires a good deal of his labor, and this limits production. You can read more at Roysgarage.com. Roy has a specific process on the crank that is similar to a gen 2 Dan crank, but this process is handled by Roy start to finish for people who select his Bearing. Back to the specific Item. You have a core crank, what’s next? Obviously, if you are going Option C), you are going to call Roy and send it to him. Looking at Option A), The best place to send the crank is to Moldex in MI. They have done more than 100 cranks over the years and they have a very good track record. At times, they process cranks in a few weeks, but at other times they have taken far longer. Even so, they are vastly better than any local crank shop you are likely to find in your home state. Before the advent of 5th bearings or Excellent processing like moldex, A number of builders broke cranks in flight engines. There were a lot of factors that contributed to this, but I am going to flat-out tell everyone that two of the biggest factors was poor grinding, magnafluxing done by unqualified people. The first caused stress risers the second failed to detect preexisting damage. Both of these errors came from local shops. Builders going to Moldex for the last 5 years has made a very large difference in the Quality of 8409 cranks going into engines. If you are looking at Option A), I consider using a shop other than Moldex a hard decision to justify. There are a number of specific issues that go into grinding a Corvair crank, like getting it dead nuts concentric. On a V-8 with a timing chain, not so big a deal. 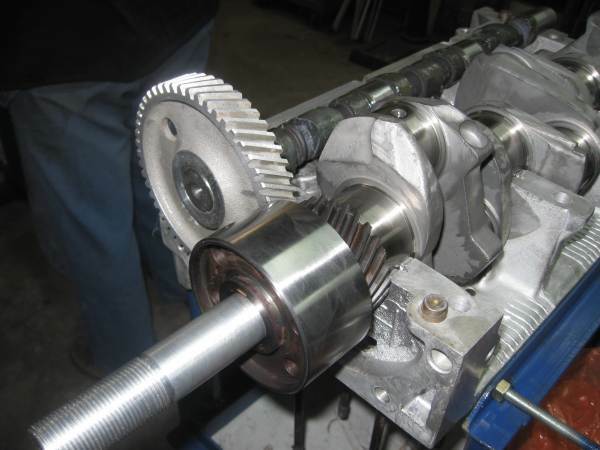 On a Corvair where the cam drive is by finely meshing gears, a crank ground to V-8 concentricity can radically overwork the cam gear. Avoid drama like this, use people we recommend. Note that you can have this service done to the crank, but delay buying the actual aluminum billet bearing housing part of the system until after your case is assembled. Using this system makes the installation far easier, because the alignment of the steel bearing surface, the part of the Dan installation that takes the time, is already done for you and it has been made fool-proof. The second half, the housing installation, is the far lower tech part of the process. One more special note: For a number of years, we have been removing the cam drive gear/flange off the crank when it is processed. Year ago, when we had everyone’s local crank shop doing the work, I was concerned about having these shops press the gear on and off. (It requires some talent and specialized tools.) In that era, cranks went to nitride with the gear on. There was all kinds of theoretical debate about this, but thousands of hours were logged on cranks processed this way. In recent years, we have reversed this because with the use of centralized qualified people, the gears can correctly be taken off and put on. It is far easier to grind the crank concentric with the gear off. But a concern of mine is that builders that do not clean the gear teeth very carefully can have tiny hardened flakes of nitrided material end up embedded in the cam gear, potentially causing a lot of trouble. This is easily avoided by having the right people remove the gear before the crank gets nitrided. Both Roy and Dan do this.